This picture is showing the Schumacher C-Car of Andy Dobson as run at the World Championships 1/12 in 1986. It seems Andy used a bone stock C-Car, at least we can´t see any special parts beside the wheel dots at the rear axle. Being a TRC team driver he used their TRC Green tires, the body was a TOJ as used by most drivers. For electronics Andy used a Futaba S132H servo, a Futaba FP-2RH mini receiver hardwired to the servo and a CS Rocket ESC. 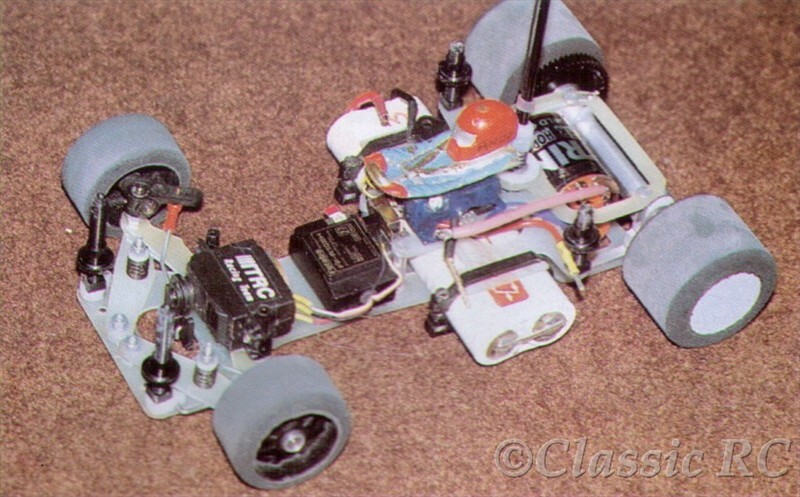 Motor was a Trinity modified motor based on the Kyosho Le Mans teardown, batteries were Schumacher 1200 SCR cells. It´s interesting the Schumacher team still was using a stick pack car when most other cars had been changed to the saddlepack layout by now. But Andy proved this concept still was capable of a top result. Andy was winning one of the triple A-Mains at this Worlds, with a 4th place overall. Basically the same car was used by Andy also for winning the European Champs 1/12 in 1985 at Fredrickstad, Norway.